With the eco-PEN series, preeflow has already established a broad base on the market of volume dispensers. Now they are mastering the next challenge in the area of 1-component precision volumetric dosing: With the eco-PEN330, the dosing specialists from Töging provide the missing link between the eco-PEN300 and the eco-PEN450 and at the same time the solution for future dosing tasks. preeflow dosing systems are valued by customers all over the world: Smallest volumes of low to high viscosity fluids are applied with highest precision and repeatability. With its broad range of one- and two-component dispensers, ViscoTec’s microdispensing specialist brand always has its finger on the pulse of the times and supplies the quality tool for high-end products of the present and the future. The precise mechanics paired with the most modern digital control unit sets new standards in the field of dosing and repeatability for very small quantities and closes a gap in the requirements for very small quantities in the 1-component range. Compared to the eco-PEN450, the eco-PEN330 has a higher filling level for the smallest application quantities and is even more precise in dosing. Due to identical installation dimensions, the customer can change from the eco-PEN450 to the eco-PEN330 without having to change parameters of the dosing system, and the newcomer can also benefit from a tried and tested dosing component with the compatible eco-CONTROL EC200-K on the control side. For optimum handling with maximum flexibility. 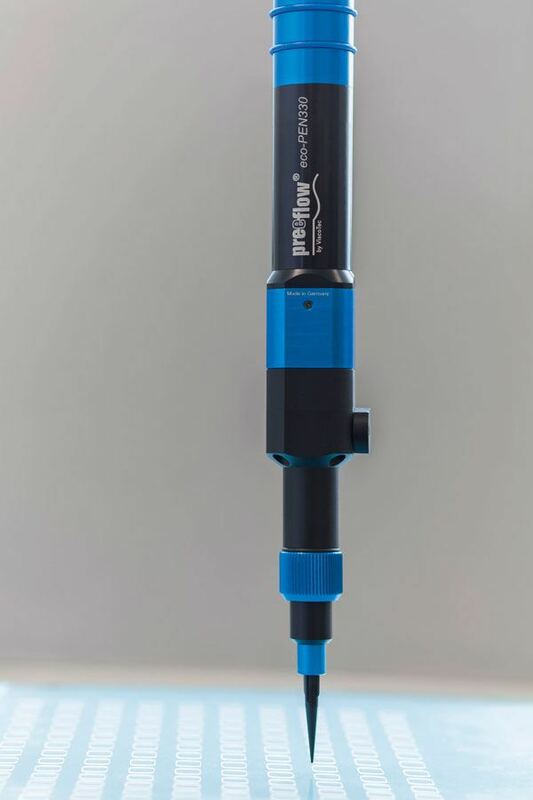 Compared to the eco-PEN300, the new one can be cleaned better – with equivalent dosing performance. Like all dosing systems of the manufacturer, the new volumetric dosing unit is based on the proven endless piston principle and operates as a rotary, absolutely pressure-tight displacement system. Perfect for conveying, dosing and applying low to high viscosity liquids. The dosing is pulsation-free and the shear forces exerted on the medium are reduced to a minimum. 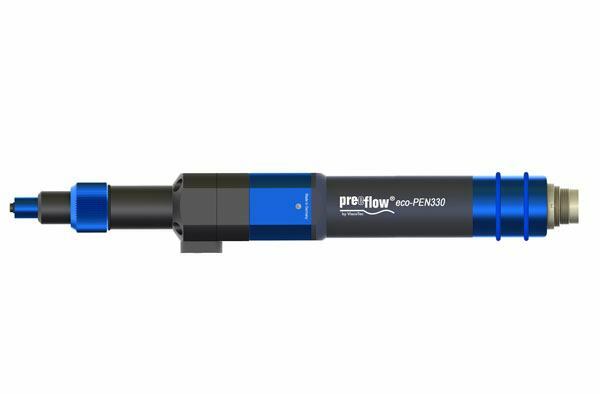 With the new dispenser, preeflow provides the answer to numerous questions from application engineers, material manufacturers, plant constructors and product developers. Be it in medical technology, optics and photonics, in the manufacture of electronic components or in the field of biochemistry and semiconductor production – none of these markets is being held back by miniaturization. This is exactly where the eco-PEN330 finds its fields of application and meets the individualized customer requirements. 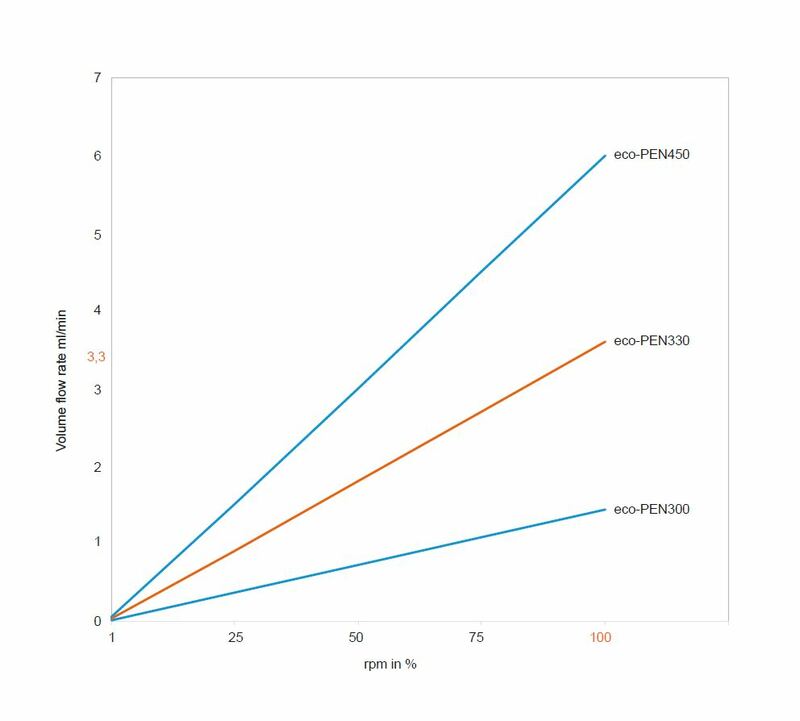 With the newly developed eco-PEN330, dosage quantities from 0.002 ml are possible – independent of temperature, time, pressure and viscosity – as dot or bead application. The microprocessor-controlled system produces a dosing accuracy of ± 1 % and repeatability of more than 99 %. Absolutely reliable and reproducible. The continuous bead application rate is a maximum of 3.3 ml/min. It goes without saying that the variable track thickness, directly proportional to the traversing speed, is realized. In combination with the company’s own high quality precision manufacturing of rotor and stator, the eco-PEN330 is a guarantor for best possible dosing results and consistent application processes. 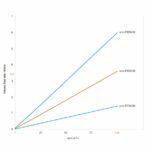 With its customer benefits, it unrivalled opens up many new areas of application in the field of microdispensing. Do you also have a missing link in your process landscape? Close your gaps with the eco-PEN330 and get the precision you need for your application. The dispenser will be presented for the first time at productronica in Munich from November 14th – 17th at the booth of preeflow’s partner Vieweg No. 361 in Hall A4.